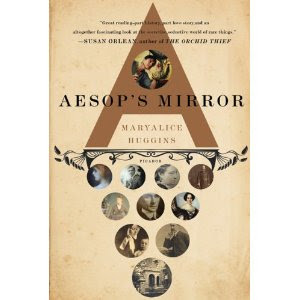 Picador recently released Aesop's Mirror in paperback and sent a copy my way to see what I thought of it. This is a memoir of sorts, surrounding an antique mirror. Written by a restorer of old antiques, Maryalice Huggins, it tells of her love and fascination for a mirror she discovered at an antique auction. The mirror's value was written off by several "big wigs" in the antique world, but Maryalice saw something special in it and decide to track down its history. The mirror becomes something of an obsession for Maryalice and she travels around the East Coast, touring old homes, and meeting descendants of the Brown family. She spends vast periods of time reading through old correspondence and wills, hoping to testify as to the mirror's heritage. The book reads as more than a memoir, but has a great deal of mystery and a healthy amount of historical romance in it as well. So what did I think of this book? Well, initially I was attracted to it because I really enjoyed reading The Big Steal: A Sterling Glass Mystery (linked to my review.) I figured if I liked a good mystery story surrounding an antique dealer, there was a good chance I'd enjoy hearing about an antique restorer. I was not wrong. Perhaps the book sounds a bit dry on the surface but it isn't at all! It's fascinating and I absolutely gobbled it up! So, you'll like this book if you like White Collar (which you'll like if you liked Monk ) or if you enjoy a good mystery entrenched in East Coast family history. You might also like if you just like pretty things and want to imagine that you could possibly afford some of those priceless treasures unearthed in families attics. Either which way, I really did enjoy this book a great deal and thank Picador most sincerely for the opportunity that they gave for me to read it! It most certainly was not dull and was not dry but was told in such a manner that I found myself eagerly awaiting the outcome of Maryalice's adventures with this mirror. It is a well-told story. Sometimes, that's really all I'm after. I like Monk...so I'm in! I'll put these on my list! I haven't read a mystery in a long time, but this sounds good. Sounds good Carrie, I enjoyed The Big Steal as well! Carrie, thanks for sharing this book (and The Big Steal) with us. I'm excited to have found some gift ideas for my daughter.